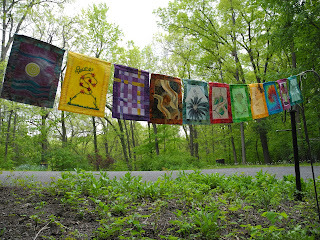 A few weeks ago, I was invited to participate in the Bhavana Project, begun by Linda Miller. 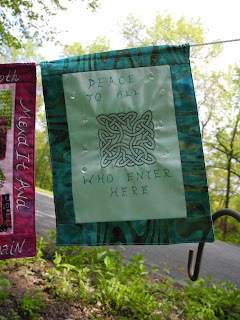 My commitment was simple - to design a prayer flag for a series on the theme of Reflections on Peace. The flag was supplied and when it arrived, along with the others in the series, I was delighted to see that blue/greens were the base. I have strong ties to my Irish heritage and those colors prompted me to immediately chose a celtic knot - a symbol of peace - for the heart of my design. The script, Peace to all who enter here, flew into my mind and heart when I meditated on the theme. As a final touch, I embellished the flags with beads that symbolized tears of hope. 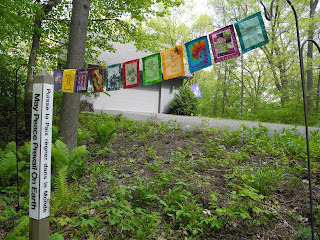 Each artist was asked to photographed the flags on display. 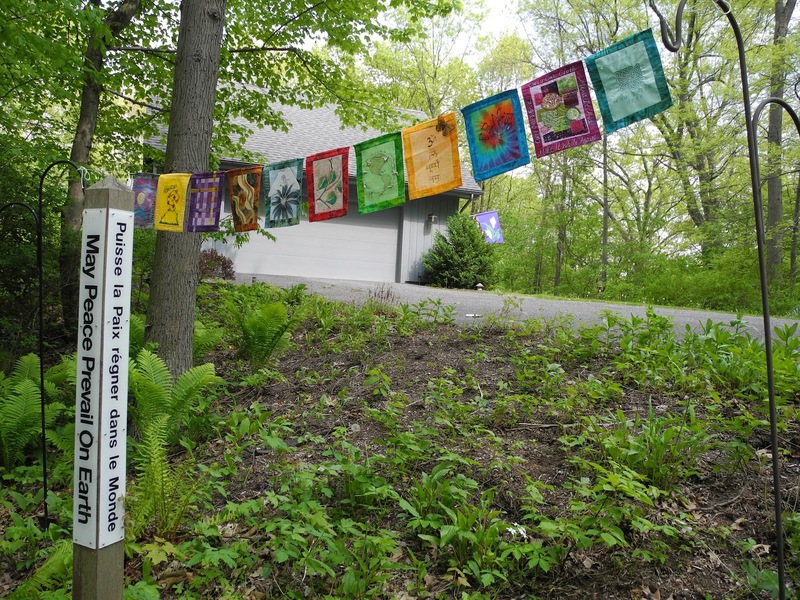 I chose to photograph mine by a Peace Pole that greets visitors to our home. It felt like an appropriate setting. I was first introduced to the idea of a Peace Pole at the Windstar Foundation in Old Snowmass, CO. Windstar, a foundation dedicated to a sustainable future, was founded in the 70’s by singer John Denver and Tom Crum, the fellow whom I worked with for the past 25 years. Participating in this project has drawn together many wonderful memories for me and I deeply appreciate the opportunity I was given. I love the peace pole idea. And the prayer quilts are beautiful! Love the colors.